Going 4-12 in the NFL is never good. It is also the worst season in 51 years for the Denver Broncos. What do they do? They bring back their former quarterback and Hall of Famer…John Elway. The Broncos have a lot of ground to make up during the off season, and there’s no doubt that Elway will have his hands full. However, if Elway’s play on the football field is any indication as to how his play off the field as executive vice president of football operations will be, the Broncos are going to be just fine. 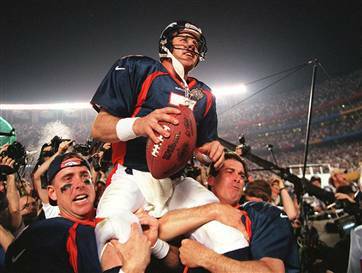 When Elway’s 16 year career was over, he retired with the most wins in NFL history by a starting QB going 148-82. He also had an NFL record with 47 comeback drives. He was second in passing yards with 51,475, and third in thrown touchdowns with 300.